This post was co-authored with Caroline Vincent, MBA student at the Fuqua School of Business, Duke University. Investments in knowledge are often heralded as important seeds for organizational success. Yet the intangible nature of knowledge means it is also often undervalued when it comes to budgetary allocations compared to more visible contributors to company performance. Fortunately, reports from the most recent CMO Survey indicate that knowledge investments are on the rise. Spend increases in four key knowledge areas—marketing training, marketing capability development, marketing research and intelligence, and marketing consulting services—are reported over the last four years. The biggest growth is in marketing capability development, with spending increasing from a change rate of 3.1% to 6.6% for an overall 112% increase in investments. Investments in capabilities are likely focused on gaps in a company’s current marketing capabilities, which are most pronounced in digital marketing, customer development and management, marketing innovation, and omni-channel execution (see The CMO Survey, August 2016). Social media is also an area where marketers report weak capabilities and is likely the target of capability development spending. When asked “How well has your company developed strong knowledge and skills in each social media area?” where 1=not at all and 7=excellent, the average rating across all capabilities was 3.7, indicating that few marketers believe they have a competitive advantage in this area. Other notable capability ratings include managing external social media partners and agencies (average=3.3), measuring the success of social media strategies (average=3.5), and developing social media strategies (average=4.1). B2B Services experienced the largest percent increase in marketing knowledge investments in three of the four knowledge areas. 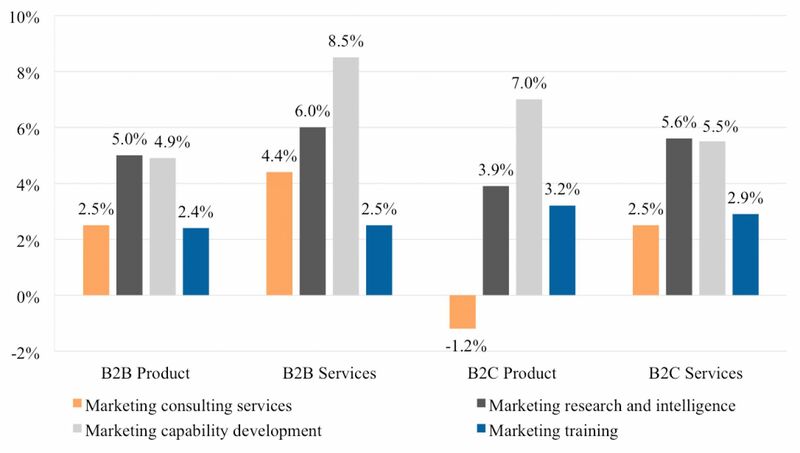 B2C Product companies experienced the highest percent increase in the fourth knowledge area, marketing training, compared to the other sectors. While investments in knowledge are rising, survey results show that Benjamin Franklin’s view that “An investment in knowledge always pays the best interest” does not hold true in all companies surveyed—at least according to training spend. Overall, as shown in the figure, training commands only 3.8% of the marketing budget. Meanwhile, social media dominates at 10.5%, followed by mobile (5.1%) and marketing analytics (4.6%). Notably, sector-level variation exists across these figures. Given the percentage growth levels reported in the 2017 CMO Survey, we expect the total knowledge budgets to fare pretty well relative to these totals. Further, we also expect that there may be overlap in knowledge investments that are also happening in the social, mobile, and marketing analytics areas. Accelerating pace of change. The accelerating pace of change in markets and technologies is challenging many aspects of marketing, including whether marketers can keep up with customer dynamics and how marketing contributes to company performance. Sharpening the marketing saw with knowledge upgrades is one way to keep pace. Advancing competitors and the threat of parity. Inevitably, competitors begin to imitate a company’s strategies over time. Hence, it is crucial that firms develop new knowledge and skills to stay ahead of this threat. Threat of siloed knowledge. Often, marketing knowledge gets stuck in one part of the company or with one group. The best companies codify what they have learned and scale knowledge across all units and relevant groups to maximize impact. Digital learning innovation. The need for skills in the digital era of marketing is rapidly growing and organizations are struggling to fill the skills gap through hiring. Furthermore, building knowledge from the ground up may be expensive and time consuming. Partnering with external agencies and consultants can help companies quickly ramp up knowledge and skills in this and other new marketing areas. Employee engagement impacts. Recent studies show that organizational engagement and employee brand proposition remain top priorities for organizations (see Deloitte’s 2017 Global Human Capital Trends). Demonstrating investments in employees and creating high impact learning can help maintain and retain the workforce. Upcoming results in February 2018 should provide an answer to this question.